So I woke up on a lazy Saturday morning last week to the gentile purring sound of our Roomba coming to life. Comforted that our dusty floor would be nice and clean for our eventual breakfast I drifted back into a light sleep. About 30 minutes later I woke up not because of a noise, but a lack of it. The Roomba has stopped. There was silence. I wasn't that concerned about it to be honest. Rarely does it get itself stuck but I haven't been as good at picking up random floor items so surely it got into trouble. No big deal. I rolled over once again and drifted into a light sleep again. About a half hour later it was time to get up and with my wife dozing next to me I slipped on my robe and went downstairs with my two dogs bouncing behind me. The first thing I noticed was the smell. We have a 4 month old puppy who is largely house trained but every now and then has an accident. And I smelled it. Poop. But as I looked into the dining room (his usual spot) I saw nothing. Then, in horror, I realized why. The Roomba had found it first. The poop, originally in a nice, tidy pile, had been hit head on by our small robotic friend. Roomba didn't notice anything out of the ordinary as it began to paint the floor in zig-zagging patterns of fresh, stinky, puppy poop. It went wall to wall. Under the couch, the chairs. The only saving grace was the lighthouse that kept it confined to one room, keeping our area rug in the living room untouched. 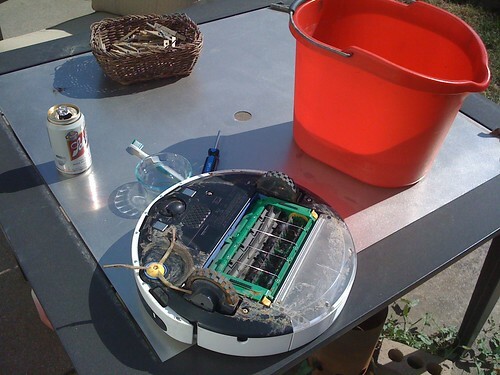 Eventaully our Roomba, choking and clogged with poop detected a problem and limped back to the dock until help arrived. As I got over the shock of the dried poop streaks covering our room I recieved a fresh wave of revulsion as I picked up the little Bot and flipped him over. The destruction was complete. Doggy poop permiated every crack and crevas of the poor Roomba. I give the little guy credit in trying. The dust bin was also filled but even advanced robot technology couldn't withstand natures oldest byproduct. Suffice to say we spent a large part of the morning cleaning. My wife with a mop, and me (rubber gloves up to my elbows) with the Roomba. I felt like a surgeon trying to save a car accident victim. I want to give huge props to the engineers of Roomba who made a truly modular robot. So much so that I was able to disassemble the little guy completely and clean each part. If I had not been able to do that I fear it would have been a total loss. It was a happy ending I am glad to say. Roomba dried out and whirred to life later that afternoon. And our puppy (though not completely accident free) has managed to avoid laying a mine just before cleaning time. I've attached picts of the carnage for those of you who desperately need a visual. Though I will say it doesn't manage to capture the full devastation. I feel so sorry for you. Did you need nose pegs? How far away is the puppy from being house trained? And you are gonna cut back on the amount of food and switch to dry right ? Wow... That is incredible. Poor Roomba! At least it didnt travel onto carpet! hee hee hee-- I mean, I'm terribly sorry! Puppy to the other dog: "Direct hit! I have succeeded in my mission to neutralize that robot menace that kept waking us up in the morning." That's almost as bad as the night that I returned from the Christmas holidays. While I was unloading the motorhome, I managed to step into a present that some dog had left on my sidewalk. It was dark, so I didn't see it. I didn't notice that a wheel of the suitcase had rolled through it as well. I did notice when I returned to the motorhome, a whiff was all I needed. Then I saw it on the carpet. When I returned to my front door I left eh shoes outside and put on some other shoes. And unknowingly stepped in it again! The end result was two pairs of shoes, one suitcase wheel, the motorhome carpet, and 4 rooms in the house needed cleaning. Thank goodness web forums don't have smell-o-vision. Gross. That is a 10 on the disgusto-meter!! Grats. No offense or anything... but your post really had me laughing! Of course, if it was me... I wouldn't be laughing & I'm sorry you had to go through this. But it's gotta be the Roomba story of the year! Oh, and I agree. The easy to access modular parts are a godsend. Be glad you've got the 5xx. That modular design I'm sure makes the job manageable. Same thing happened to me. We left the dogs out instead of putting them in their kennels and one dropped a load on the carpet. It also got dragged, but across my main room's carpet. My Discovery did a fairly good job of jumping on the grenade, but the carpet needed shampooed. And it looked so bad to me, I just bought two more when they came up on Woot for $99 bucks a piece in November. I'll probably clean it out someday, but right now it's out in cold storage in the garage. Wow...after something like that, I probably would have declared my Roomba a casualty of war. I was afraid this would happen someday. It had been about a month since my dog had messed in the house. The wife noticed it right away and stopped the roomba. It smeared po for about 5 feet while doing an edge clean. Nothing got into the brushes, but both wheels were crammed with poo. I let it dry before cleaning it figuring it would flake off easier. It is now working on my basement arcade for a few days to shake loose any little bits that are still in the treads. I don't schedule my roombas because of dog toy and cat barf encounters! I'm astonished that my Roomba hasn't encountered cat barf yet.